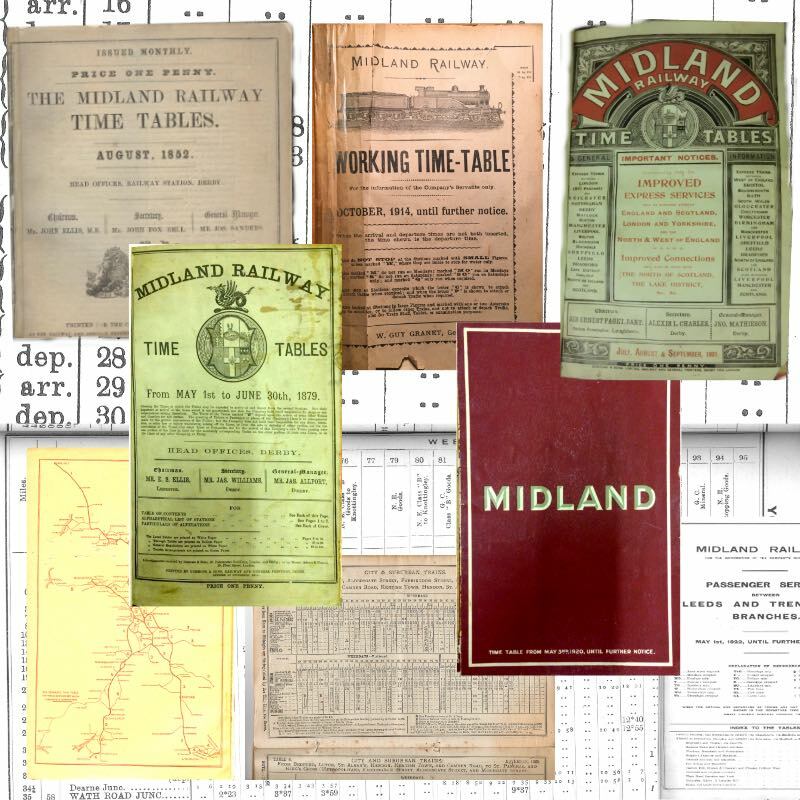 The Midland Railway Timetable Finding Aid lists the public and working timetables of the Midland Railway and its constituent companies held by three organisations where public access is allowed to their collections. The two principal constituents are, on the mainland, the London, Tilbury & Southend Railway (LT&SR) that was absorbed with effect from 7 August 1912 and, in Northern Ireland, the Belfast & Northern Counties Railway (B&NCR) that was absorbed on 1 July 1903. Timetables issued by Joint Lines in which the Midland Railway had an interest are not included in this document. Located at Leeman Road, York, YO26 4XJ, the NRM website as shown above gives a wealth of information about the museum including full details of opening hours and accessibility. It also provides access to its online library and archive collection lists. Housed in Derby’s Silk Mill, the Study Centre is a collaboration formed by The Midland Railway Society and Derby Museums; its address is c/o Derby Museum & Art Gallery, The Strand, Derby, DE1 1BS. The website as shown above gives visiting details and also provides a link to the Study Centre Catalogue. Located at Kew, Richmond, Surry, TW9 4DU, the TNA website as shown above provides all necessary details about this hugely important national resource, with full information about visiting and registration. It also provides on-line access to Discovery, the catalogue that holds more than 32 million descriptions of records held by TNA and more than 2,500 archives across the country. The National Archives have kindly given permission for the listings that make up this finding aid to quote catalogue references from Discovery. The Midland Railway Study Centre is extremely grateful to David Geldard, Roy Burrows and Mervyn Bryce for the compilation and production of this work. Click to download - 2.1Mb PDF. 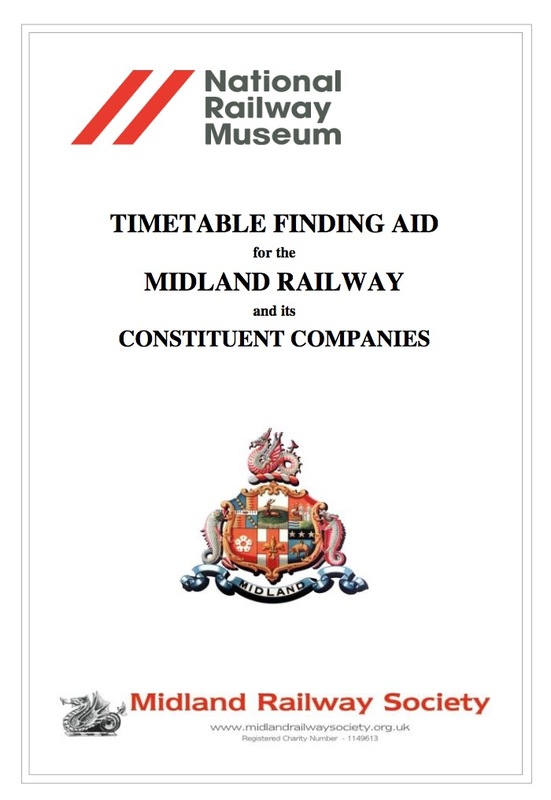 (MR Timetable Finding Aid PRINT.pdf - 1.7Mb PDF).